Kaku-kanten is a food made by boiling gelidiaceae or any other red algae, rolling into a cylinder, and leaving out to dry. It is sometimes called stick kanten. 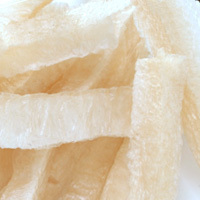 Jelly made using kanten contains 1.5 calories per 100g with 0.7 grams of fiber. It can be used in salads, vinegar dishes, and stir fry in addition to be cooked using a pressure cooker. The calories in Kakukanten per 8g(1piece length 25cm) is 12 calories. Kakukanten is calculated to be 154Cal per 100 grams making 80Cal equivalent to 51.95g with 5.93g of mostly carbohydrates、0.19g of protein、0.02g of fat in 8g while being rich in vitamins and minerals such as Calcium and Manganese.